Before becoming a full-time special education teacher, Lori Mayfield (B.B.A. ’12) was actively involved in the St. Mary’s University community and a part of the Greehey Scholars Program. Mayfield has always had an interest in applying her business management knowledge to teaching. Her involvement in Junior Achievement while at St. Mary’s provided her with hands-on teaching experience, giving her the leadership skills Teach For America seeks when recruiting college students and working professionals. 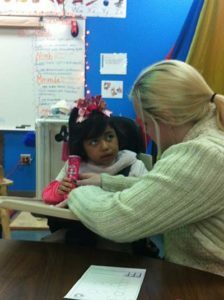 During her kindergarten rotation with the Junior Achievement program, Mayfield developed an interest in special education. After meeting with the student’s teacher, Mayfield discovered the student was receiving special education services. Mayfield’s experience with Junior Achievement led to an interest in joining Teach For America in November 2011, specifically in special education. “I wanted to bring my knowledge – just acquired in the Greehey School of Business – coupled with my knowledge of teaching and my passion for educating young students, to a public school in San Antonio,” Mayfield said. According to Career Index by Education News, there are only five accredited special education schools in San Antonio. This need led Mayfield to decide to keep teaching special education after completing her two-year commitment as a Teach For America corps member. “Through my time teaching in SAISD and as a Teach For America alumna, I have learned that all students – regardless of perceived ability or disability – have the potential to learn and achieve at extraordinarily high levels,” said Mayfield, echoing the Teach For America mission. Mayfield is currently a Pre-K Special Education Teacher at Crockett Elementary in the San Antonio Independent School District and has recently accepted a teaching position at a San Antonio public charter school. Mayfield continues to provide quality education in a S.O.L.E. (Safe Optimal Learning Environment) classroom to help all students reach their full potential.